Old map by PORCACCHI -Discorso Intorno all Carta da Navigare. 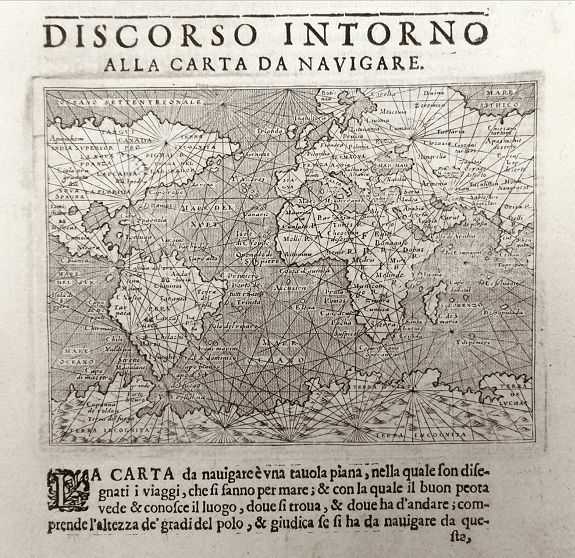 Title: Discorso Intorno all Carta da Navigare. Size: 5.7 x 4.1 inches. Condition: Strong impression. Sheet in very good condition. An attractive early world map showing various navigational features of the globe. Published in Porcacchi's Isolario entiled "L'Isol Piu Famose Del Mondo'. This nautical world map, engraved by Girolamo Porro, was one of two world maps included in Porcacchi's popular pocket-sized atlas. It covers most of the world, excluding far eastern Asia and the western coast of North America The Terra Incognita landmass dominates the bottom of the map. The handsome map is filled with rhumb lines and the seas are fully stippled. Printed on a full sheet of Italian text. 300 x 210mm. Reference: The World Encompassed (Baltimore 1952) No 86; Shirley: Mapping of the World, 128, Plate 109..